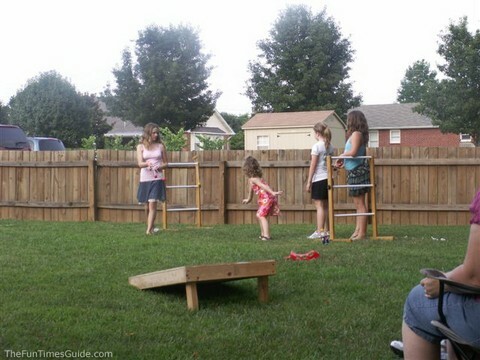 Bolo Toss — also known as Ladder Golf — is an extremely addictive backyard game of skill… similar to horseshoes, but different. It’s a lawn game that is appropriate for all ages, and can actually be played indoors as well as outdoors. Simply put, you toss a Bolo (piece of rope with a golf ball attached at both ends) toward a Ladder (usually made from PVC plastic pipes) with the hope that it will wrap around and cling to one of the individual rungs on the ladder. Which rung of the ladder your bolo clings to ultimately determine your score, or whether your toss simply “cancels out” your challenger’s. 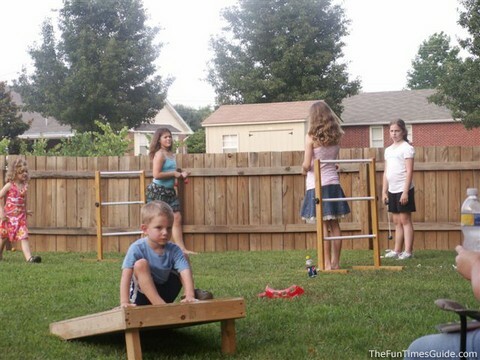 This backyard game appears to have gotten its start at the campgrounds across America. RVers and campers have a special fondness for this unique (and popular!) outdoor game, as do tailgaters. 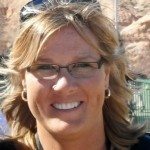 Norwegian Horseshoes, Laddergolf, Snakes, Hillbilly Golf, Polish Golf, Horseballs, Tower Ball, Bolo Golf, Gladiator, Snake Toss, BlongoBall, Ladder Toss, Bolo, Rodeo Golf, Dingle Balls, Cowboy Golf, Redneck Golf, Pocca Bolo, The Snake Game, Willy Ball, Ladder Ball, Slither, Snakes & Ladders, Hillbilly Horseshoes, Flingy Ball, Top Toss, Norwegian Golf, Monkey Bars Golf, Swedish Golf, Polish Horsehoes, Dandy Golf, Montana Golf, Lasso Golf, Australian Horseshoes, Ladder Game, Monkey Balls, Golfball Horseshoes, Arizona Golf Balls, Spin-It, Ball Dangle, Bolo Ball, Poor Mans Golf, and Bolo Toss. Though this game has many names, most are very similar even though there are slight variations in the rules for each game. Here are the official rules of play for Bolo Toss and for Ladder Golf. See how to keep score when playing Bolo Toss or Ladder Golf. You could probably get all the parts needed to build the golf ladders on your own for under $20. Or, you could buy an already built model for $40 to $70. You will need three bolo “sets” per team. Each set consists of two balls secured to a rope, for a total of 12 balls. For children, consider whiffle golf balls — you’ll need to “weight” the balls by tying the string to a small washer. To ease the rope through the hole in the ball, first harden the end of the rope by holding it up to a flame for a few moments. 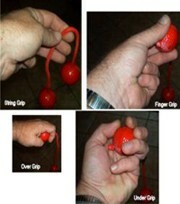 There are a number of ways to secure the balls to the rope. First, pre-drill a hole 1/2-way or all the way through the ball. Use hot glue and a screw. (Set the rope hot glue first. When dry, angle a 1/2″ screw through the rope until it’s flush with the ball. Remember, after securing the rope to them, you’ll want to paint the balls so that you have 3 “sets” of one color (6 balls) and 3 “sets” of another color (6 balls).